If you’ve been paying even unconscious attention to this year’s Oscars, you know who the frontrunner is for Best Picture. Sometimes it takes a longer time than usual for one to emerge, but there always appears to be consensus, even in a year with so much depth in the Best Picture category. The nine out of a possible 10 nominees shaped up as most people thought they would, and with success at the Producers Guild of America Awards and the Directors Guild of America Awards, wins for the Best Picture – Drama at the Golden Globes, Best Film at the BAFTA Awards, Best Picture at the Critics Choice Awards and even Outstanding Performance by a Cast at the Screen Actors Guild Awards, Argo will assuredly be mentioned at the end of the telecast tomorrow night with Ben Affleck and George Clooney providing some great photo ops (Clooney produced with Affleck and Grant Heslov). It’s been a long road for “Argo.” When it came out in October, it became one of the first bonafide contenders for Best Picture. The film has had great legs at the box office too, with $127.8 million to date. There were still a lot of buzzed-about films according to the festival circuit, so no one was about to start prophesying Oscar gold. 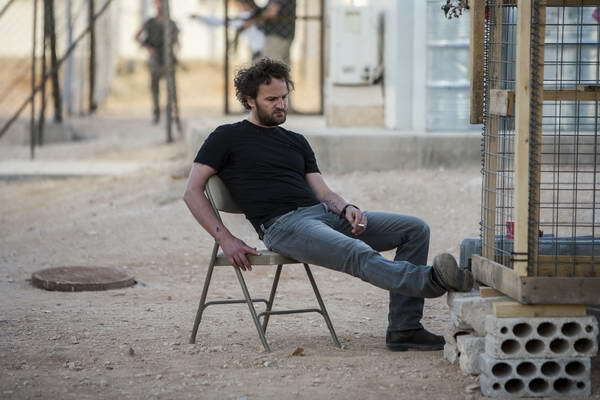 Then when December hit and critics awards started pouring in, Zero Dark Thirty appeared to be pounding “Argo” into dust, naming it best picture and Kathryn Bigelow best director. The public hadn’t even seen the film yet, but at that point many felt we had our Best Picture figured out. Then “Zero Dark Thirty” started making noise for all the wrong reasons, losing favor with Academy members bothered by its depiction of torture, and the U.S. Senate started firing away at its credibility or fishy surplus thereof. Despite more praise from audience and critics and a wide release the weekend following the Oscar nominations, the film was poised to have all the momentum, but the directing snub of Bigelow changed everything. “Zero Dark Thirty” fell considerably, so far that I give it eight percent of the votes for Best Picture. It received only five Oscar nominations, and most of the time the winner goes to a film with a lot more. 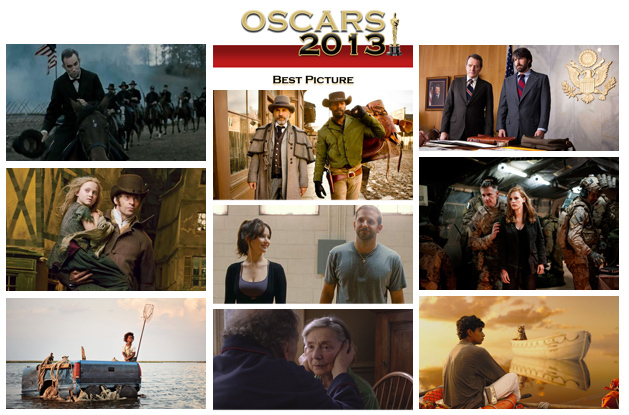 With only seven nominations, “Argo” doesn’t exactly have a lot more, but all those wins don’t mean nothing. If any two films are going to somehow pull off an upset, it’s going to be the ones with the greatest number of nominations: Lincoln or Life of Pi. Word of mouth for “Life of Pi” never took off, so a lack of popularity will keep it off the stage at the end of the night, even though you might be hearing a lot about it for the first hour of the ceremony. “Lincoln” is a film that everyone wants to recognize but no one thinks is the best of the year. The film has consistently lost to “Argo” in the other awards events and though it might be a “Lincoln” party up until the announcement of Best Picture, it doesn’t appear to have a chance at winning top prize. Also incredibly popular has been Silver Linings Playbook. It’s this year’s “acting” nominee, or the Best Picture contender that won a lot of audience favor, has a lot of acting nominations and chances to win, but isn’t being taken seriously in the artistic categories of Best Direction or Best Screenplay. “The Help” was last year’s and David O. Russell’s last film, “The Fighter” was 2011’s. The film also has the infamous muscle of Harvey and Bob Weinstein, whose company can take credit for the last two Best Picture winners. They brilliantly unraveled the film slowly but surely into more and more markets to build word of mouth and when the Oscar nominees came out, they let it fly. It’s not the most financially success of the nominees by any means, but in terms of awards buzz, it has assured that the film stayed in the conversation for all two months of the season. You might be wondering why I give almost no chance to Les Misérables when movie musicals have had a long, successful history at the Academy Awards. Popular it was, and many thought it was excellent, but in terms of doling out awards, many feel there was a lot better. Director Tom Hooper’s approach divided audiences and critics, and as such he was not nominated. Neither was the film’s script. That means the whole film leans on the performances of star Hugh Jackman and supporting star Anne Hathaway. No other Best Picture nominee this year failed to get a nom in at least one of those categories: Best Screenplay or Best Director. Beasts of the Southern Wild managed to get nominated in both categories, yet no one’s taking 2012’s independent gem seriously in this category (or any category), whether fair or not. That leaves Django Unchained. Foreign audiences/awards bodies seem to have taken more to this film, with the Golden Globes awarding Quentin Tarantino Best Screenplay and Christoph Waltz winning the Globe and BAFTA Award for Best Supporting Actor. It’s been a hit with audiences, but The Weinsteins chose to back “Silver Linings Playbook” instead, knowing how “Inglourious Basterds” turned out (one win in eight nominations). Everyone wants to honor Tarantino’s work, but no one wants to recognize his films as superior come time to award the winners. Even if Tarantino bags Best Screenplay, that will be the film’s one big win for the night. In a competitive year, meaning lots of quality films deserving of the title of “Best Picture,” it makes voters even more likely to gravitate toward the movie everyone’s talking about. My favorite film on this list was “Beasts,” with “Argo” and “Zero Dark Thirty” very close behind, but if I’m voting, I know “Beasts” doesn’t stand to win, and I really enjoyed “Argo” and would like to see it victorious. I think no matter how crazy things go during the ceremony or if one film wins more than people expected, “Argo” should still win Best Picture. It could win nothing else I think, and still win Best Picture, which would mark the first time than happened since “Mutiny on the Bounty” won in 1936.